The GDPR went into effect in May 2018, requiring businesses around the world to protect the personally identifiable information of citizens from the EU. The regulation is in effect but, many businesses are still struggling with how to properly implement protections across systems and processes. 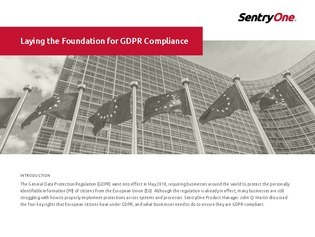 In this white paper, SentryOne Product Management John Q. Martin discusses the 4 key rights that European citizens have under GDPR, and what businesses need to do to ensure they are GDPR compliant.